In 2001, the Honda decided to go green, taking the popular Honda Civic and offering it with a hybrid powertrain to the Japanese market. Though Honda no longer produces the Civic Hybrid in Japan, the hybrid still remains one of the top selling electric hybrid cars in the U.S., sealing the Civic’s popularity in North America. When the first Honda Civic Hybrid hit production lines at Honda’s Suzuka, Mie, Japan assembly plant, it was based on the seventh-generation Civic. The hybrid was introduced to the U.S. in spring 2002, making it the first vehicle that Honda had mass produced with a gasoline-electric hybrid system and the second hybrid model of the company after the Honda Insight. 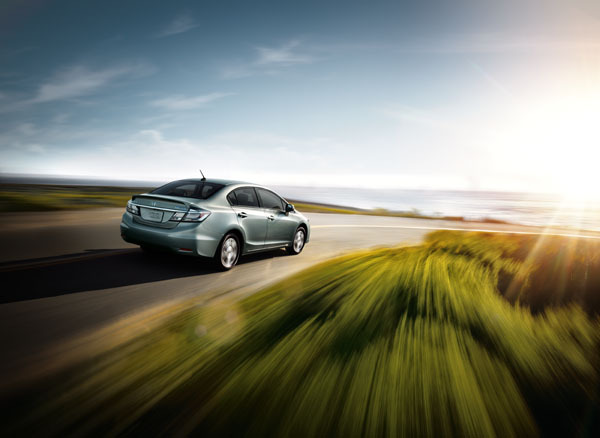 The Civic Hybrid was also the first hybrid vehicle to be certified by California’s Air Resources Board as an Advanced Technology Partial Zero-Emissions Vehicle (AT-PZEV). Recently, the Honda Civic Hybrid has undergone multiple changes, including a change in assembly plants. After moving from the Suzuka plant, the hybrid is now produced at the Honda Manufacturing of Indiana plant and Honda’s plant in Swindon, England. Now in its third generation, the Civic Hybrid has changed its hybrid drivetrain, increasing its fuel economy from 40 mpg to 44 mpg.